“Navajo Design” is stamped with tinted top boss embossing powder and embossed with a rust embossing powder on white card stock, then colored with markers and cut out. 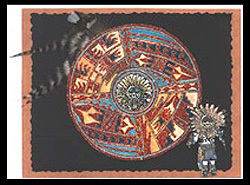 The center of the design is cut out and placed over a stamped and colored head of “Hopi Kachina #1, Sm.” The Hopi Kachina is then stamped, colored , cut out and placed with mounting tape in the lower right corner of the card after the card is layered with black linen card stock trimmed with deckle scissors and cocoa colored card stock. Feathers are placed in the top left corner under the Navajo design. This card, made jointly by Pamela Hewitt and Margaret Wiggin, was one of those cards that took all evening to make and was so-o-o much fun to do! “Vine/Wood Frame” is embossed in green on white card stock. Inside the frame the following stamps are stamped with black memories: “Dancing with the Peace Maker”, “Dancing Round & Round!”, and “Mushroom, Sm.” The mushroom is stamped twice and masked to stamp the second mushroom as well as “Dancing Round & Round!” The images grass and sky are colored with pencils. Card by Pam Hewitt. “Birch Grove”, “Birch -Two Crossed, Sm.”, “Birch – Two Crossed, Lg.”, “Birch – Two Straight, Sm.”, “Doe by Branches”, and “Moose in Grass” were embossed in black on white matte card stock. 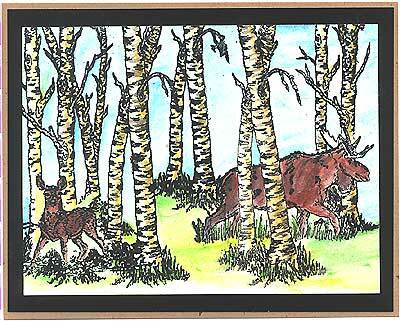 Images were colored with pencils, and card was layered on black and tan card stock. 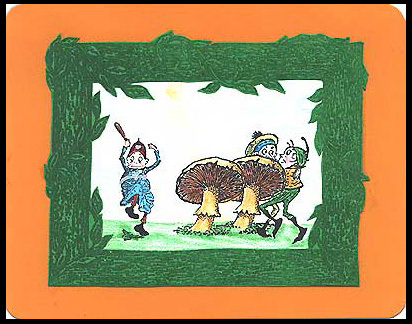 Card by Pamela Hewitt.